Time for another edition of What’s Hot + What’s Not. Spending a lovely long weekend with my parents in the Blue Mountains. We drove up on saturday and stayed until Tuesday. My Dad had surgery on his hand this week (it went very well, yay!) and we took him to the hospital and picked him up. We all enjoyed some long chats about all kinds of things, watched ‘Babe‘ (which was the first viewing for me and my parents) and ‘Jane Eyre‘ and enjoyed some yummy food as always. I love getting to spend quality time with my parents. (*waves* to Mum and Dad) Plus I also got some long snuggles with my kitty Max, and Mum and Dad’s cat, Pearl. It is also so nice to get away from Sydney and escape the noise and heat and enjoy some real peace and quiet. I’m always struck by how much quieter it is in the mountains. The most ‘noise’ you hear is birds and the wind rustling through the trees and at night, the sound of owls hooting away at the moon. I grew up in the Blue Mountains and am very much a mountain girl at heart. I’m afraid I shall never grow to appreciate city life or acclimatise to hot weather! I found the above in an op shop for $2. 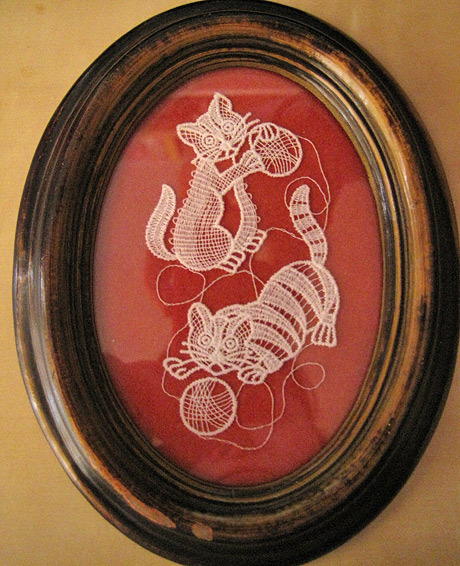 I adore kitties (especially my own Kitty Max) so I had to have this. I think the kitties may be tatted? What I thought was velvet backing material, is actually some kind of flocked paper. The frame itself is plastic with paint applied in a wood pattern. It’s a bit scratched so I’m going to repair it. I’m not sure whether to redo the wood pattern, or paint the frame white. Any suggestions? 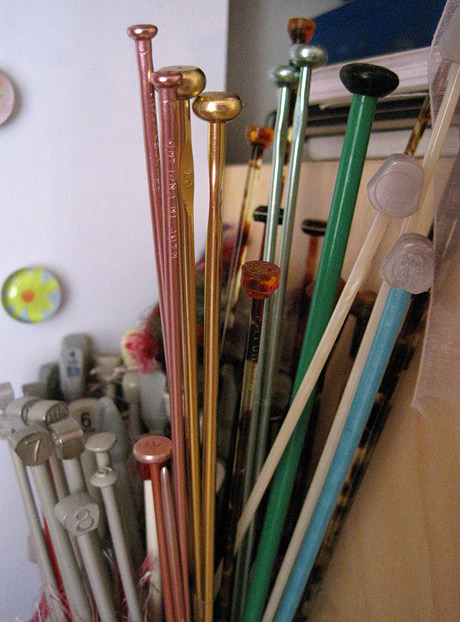 Found at the same op shop for $1 a pair; vintage aluminium knitting needles. I love these, and have a collection on my desk that include some from my late Aunt and Grandmother and also op shop finds. The new ones are the pink and gold needles at the front. The awful, awful weather in Sydney today. 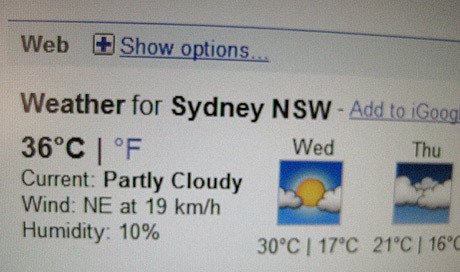 I find anything over 24°C uncomfortable, so 36°C is appalling to me! I call this kind of weather ‘uncivilised’ because you can’t move and remain feeling nice and fresh. You end up feeling all hot and icky. I was born in winter and grew up in the Blue Mountains so cool, wintery weather is my thing. I adore winter, especially if I get to see some snow! Hot weather makes me feel physically sick and I really don’t handle it well at all. I think (?) most people with asthma seem to find humid weather (or at least warm) easier in terms of breathing; I’m one of the rare ones who find very cold, crisp air easier to breath. In this weather, I’ve been known to open the freezer and inhale deeply of its delicious cold crispness!